Perfect for trips, rainy days, or downtime, these crosswords—created by the expert editors at Puzzlewright—will entertain kids for hours. You’re never too young to start having fun with puzzles! 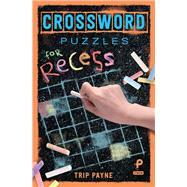 Crosswords are a great way for children to exercise their brain and have fun with words—and these 40 kid-friendly puzzles are perfect for starting them off. Children will love the fresh look and clever clues in this collection. Trip Payne is an American professional puzzle maker and a three-time champion of the American Crossword Puzzle Tournament. With his first victory, in 1993 at the age of 24, Payne became the youngest champion in the tournament's history, a record he held until 2005. Payne has been published in numerous newspapers and magazines, and his books include Large Print Cryptograms, Pop Culture Word Search Puzzles, Bizarre Crossword Variants, and USA TODAY® Celebrity & Pop Culture Crosswords (all published by Puzzlewright Press). Learn more about Trip Payne at tripleplaypuzzles.com.